Grey Seals at Blakeney Point in Norfolk. Blakeney Point (officially called Blakeney National Nature Reserve) is a National Nature Reserve situated near to the villages of Blakeney, Morston and Cley next the Sea on the north coast of Norfolk, England. Its main feature is a 6.4 km (4 mi) spit of shingle and sand dunes, but the reserve also includes salt marshes, tidal mudflats and reclaimed farmland. It has been managed by the National Trust since 1912, and lies within the North Norfolk Coast Site of Special Scientific Interest, which is additionally protected through Natura 2000, Special Protection Area (SPA), International Union for Conservation of Nature (IUCN) and Ramsar listings. The reserve is part of both an Area of Outstanding Natural Beauty (AONB), and a World Biosphere Reserve. The Point has been studied for more than a century, following pioneering ecological studies by botanist Francis Wall Oliver and a bird ringing programme initiated by ornithologist Emma Turner. Blakeney Point has a mixed colony of about 500 harbour and grey seals. The harbour seals have their young between June and August, and the pups, which can swim almost immediately, may be seen on the mud flats. Grey seals breed in winter, between November and January; their young cannot swim until they have lost their first white coat, so they are restricted to dry land for their first three or four weeks, and can be viewed on the beach during this period. 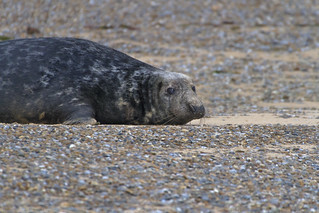 Grey seals colonised a site in east Norfolk in 1993, and started breeding regularly at Blakeney in 2001. It is possible that they now outnumber harbour seals off the Norfolk coast. Seal-watching boat trips run from Blakeney and Morston harbours, giving good views without disturbing the seals.